Tee Off with our Dreams Las Mareas Golf Package! Sometimes visiting just one country isn’t enough! If you want to make the most out of your vacation in paradise, then Dreams Las Mareas Costa Rica has the perfect package for you. 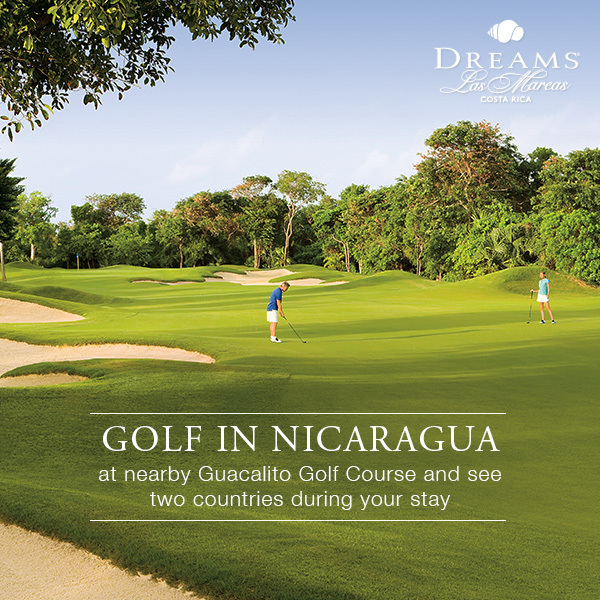 Spend your vacation basking in the golden sun of Costa Rica at Dreams Las Mareas, then head on over to Nicaragua for an invigorating round of golf at the famed Guacalito Golf Course with the Dreams Las Mareas Golf Package. There couldn’t be a more perfect way to see two gorgeous countries in one trip, while getting to practice your back-swing! Stay in Costa Rica and golf in Nicaragua during your stay at Dreams Las Mareas Costa Rica! Located at Guacalito de la Isla in the gorgeous neighboring country of Nicaragua, Guacalito Golf Course, designed by the award-winning golf course designer David McLay Kidd, is a short 2-hour drive from Dreams Las Mareas Costa Rica. This golf package includes round-trip shared transfer from Dreams Las Mareas, arrival and departure taxes for Nicaragua and Costa Rica, greens fees for 18 holes, a golf cart and usage of Callaway Razr-X golf clubs. You’re sure to get hungry and thirsty out there, so domestic drinks and lunch are included in your package as well! Enjoy this package for $390 USD per person. Companions who do not wish to golf may join for $250 USD per person. After you put in your game of golf, relax knowing that the rest of your trip will be spent enjoying the unparalleled beauty of Dreams Las Mareas Costa Rica. Located in the beautiful Playa El Jobo on the Northern coast of Guanacaste, Dreams Las Mareas features an expansive palm-studded beach and lush tropical jungles.The resort boasts a contemporary design with tasteful authentic décor, along with all the inclusions of Unlimited-Luxury®. Ready to treat yourself to a multinational trip to paradise and an unforgettable golf outing? Book your getaway today and save with the Dreams Las Mareas Golf Package. This entry was posted in Dreams Las Mareas, Dreams Resorts & Spas and tagged Costa Rica, Dreams Las Mareas, Dreams Resorts and Spas, golf, Golfing, greens fees, guacalito golf course, nicaragua, Package deal. Bookmark the permalink.